Although it is well known how to attain a wish, birthday, four leaf clovers, shooting stars, ect, it is relatively unknown how our actions following that wish affects the outcome. One hypothesis holds that once a wish is made if the wish maker then speaks what the wish is to others it will cause the wish not to come true. In this experiment Scientific AmeriKen investigates the validity of this hypothesis. Although most in the scientific community may not agree with the notion of a "wish", for the purpose of this experiment Scientific AmeriKen will assume they exist. The hypothesis of this experiment is that speaking the wish aloud will have no effect on the success of the wish. Although there can be no concrete rational for this hypothesis, its basis will be on the belief that granting of wishes is done instantaneously upon the thought of the wish and therefore any event following the wish would not have an effect. In this experimnt 24 Florida State lottery tickets (left) were purchased. 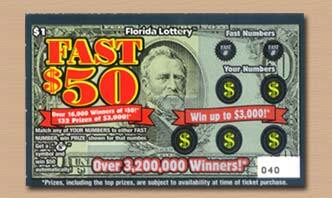 Prior to scratching the first set of 10, a wish to the effect of "I wish this ticket would win" was thought and then the ticket was scratched. The next set of 10 was done in the same matter except before scratching the wish was said aloud to an assistant. Finally, 4 tickets were used as a no wish control. Additionally, scratching of tickets was split evenly with an assistant to insure personal luck was not involved. 1 of each a quiet wish and a spoken wish won of the 10 attempts for each. Additionally, all 4 no wish tickets failed to produce a winner. The research supports our hypothesis that whether a wish is spoken to others does not affect the outcome of the wish as seen from equal quiet for spoken wish success rate. The effectiveness of wishing was demonstrated by a roughly 10% wish success rate over no wish. This suggests that wishing may play a role in whether the lottery ticket wins or not. As far as why the success rate was so low may have resulted from the fact that no wish generation was used. It was just assumed that there were a few unused wishes coming from some eyelashes blow away, usused birthday wishes and some seen shooting stars. These observations imply significant importance to the generation of wishes and further research may not only provide critical information regarding this issue, but also eliminate the need for any further donations to Scientific AmeriKen. Scientific AmeriKen would like to thank Mrs. Scientific AmeriKen for her assistance during the experiment.